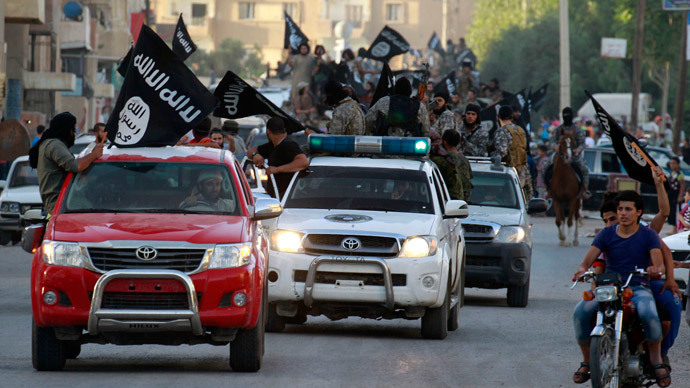 ISIS capitalizes on Libya security vacuum, establishes ‘legitimate foothold’ – State Dept. Amid a chaotic situation in Libya three years after the US-led NATO operation toppled Colonel Gaddafi, Washington is voicing strong concerns over the growing influence of Islamic State radicals in the country. As Islamist Libya Dawn and Operation Dignity factions, headed by Lt Gen. Khalifa Haftar, battle for power in Libya, creating a separate government and army rival to internationally-recognized Abdullah al-Thani’s parliament in Tobruk, at least three terrorist groups in north African country swore allegiance to the Islamic State (IS, formerly ISIS / ISIL). These new ISIS affiliates in Libya are the IS Barqa Province, IS Fezzan Province and IS Tripoli. The US State Department says that between 1,000 to 3,000 militants in Libya are now fighting for the Islamic State cause. Since the start of the year, IS carried out a number of attacks and have captured the Mabruk oilfield south of Sirte, according to a report by the State Department’s Diplomatic Security Bureau. The militants also beheaded 21 Egyptian Coptic Christians earlier this year. “An expanding security vacuum has given ISIL an opening to establish a legitimate foothold,” the report says according to Washington Free Beacon. “ISIL is capitalizing on the conflict to conduct sophisticated attacks, but so far has made only limited territorial gains, and is already facing backlash from Libya Dawn,”the report adds. US estimates state that at least 800 ISIS fighters are based in the Derna area, 300 of whom have previously fought in Syria or Iraq. Meanwhile, according to US officials who spoke to Reuters, several “senior” Islamic State leaders traveled to Syria to recruit fighters particularly in the cities of Derna and Sirte. The State Department believes that ISIS influence in the country has reached critical proportions, especially in the ideological pressure jihadists exert. Some US firms were forced to leave Libya, which had become a springboard for fighters from across Africa wanting to join the Islamists, from which they could travel to Syria for frontline experience. The State Department is certain that Libya’s government is incapable of providing security especially for Libya’s oil fields which are constantly attacked by Islamic State militants. IS is gaining a massive following across the wider Middle East and Africa including Nigeria, Yemen, Afghanistan, Pakistan and Egypt’s Sinai Peninsula. There is evidence that militants who killed 20 foreign tourists in an attack on a museum in Tunis also had links to ISIS.